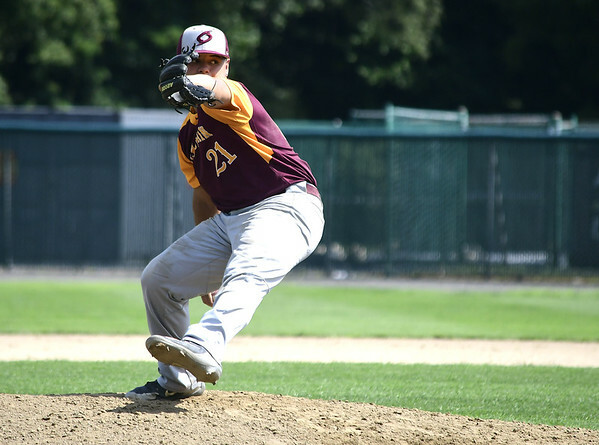 NEW BRITAIN - Rufino Santiago did his part on the mound for the NB Boys (New Britain) in the Nutmeg Games 18U baseball tournament against the Stratford Spartans. The team’s defense did not. “Errors, errors, errors,” NB Boys head coach Guillermo Burgos said. None proved costlier than the one by New Britain shortstop Kevin Rodriguez in the bottom of the seventh inning, which allowed the Spartans’ Angelo Salaman to score the game-winning run from third and hand the NB Boys a 3-2 loss. The run wiped out a strong outing by Santiago, who only gave up one run and didn’t surrender a hit in 5 2/3 innings on the mound. The lone run Santiago did give up was unearned as a result of a pair of errors in the field in the fifth. Stratford had a chance to tack on more runs in the inning, but was shut down quickly by Santiago. With a runner on first, another on third and just one out, the NB Boys pitcher threw six consecutive strikes to end the frame. It wasn’t until after Santiago was relieved from the game New Britain started to fall apart. The bullpen brought out Alex Rozario. In the 1 1/3 innings he pitched, Rozario allowed two hits and two runs. The NB Boys scored the first run in the third after Andrew Pulcini hit a sacrifice fly to drive in Jordan Arizari and tacked on another run in the fifth after an error by Spartans catcher Michael Heyer allowed Francisco Alvarado to run home. New Britain had the opportunity to break the game open in the top of the seventh, but was unable to generate a hit with the bases loaded. Stratford pitcher Billy Augustine struck out Isaac Rosario and Santiago to end the threat. Despite the loss, the day didn’t end too badly for the NB Boys. An 18-11 win over Bridgeport Baseball (18U) secured New Britain’s spot in the gold medal game today at 3 p.m. at Beehive Stadium. Posted in New Britain Herald, New Britain on Saturday, 28 July 2018 20:30. Updated: Monday, 30 July 2018 20:41.